UN Women works in Za’atari refugee camp to support refugees to meet their daily needs, while also working to build confidence, empowerment and equality. This is done through the implementation of Za’atari’s largest female focused cash for work programme, with almost 200 women and men (80% women) engaged per day to deliver essential services to the Za’atari camp economy (e.g. the production of school uniforms and comprehensive maternal kits). In 2016 this will expand to close to 420 people engaged per day. Cash for work opportunities are paired with comprehensive protection referral services, life skills services in the form of Arabic and English literacy and computer classes and day care services for working parents. Classes on parenting, mental health and other key issues affecting the camp population are offered by UN Women partner in our centres, and ARDD-Legal Aid partners with UN Women to role out #HeforShe dialogues, engaging men and boys on issues of violence against women and gender equality in the camp. This work – delivered as a holistic package – has led to a 20% reduction in domestic violence amongst those benefiting from the programme. 76% state a positive change in intra-household relations. On average, each refugee’s monthly income has increased from 10JD per month to 145JD per month, with 70% of the spending going on fresh meat and fruit for their families. Moreover, 91% of beneficiaries state increased household and community decision-making as a result of the intervention, with 96% emphasizing the positive impact cash for work and other services has on their mental well-being. This work is made possible by generous funding received from the Governments’ of Korea, Finland, Netherlands, Italy and Japan. 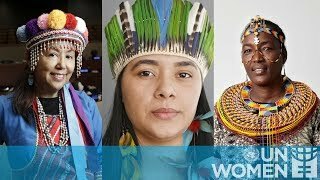 In delivering this work UN Women partners with UNFPA, UNICEF, UNHCR and WFP. 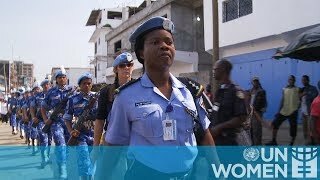 Why do women in peacekeeping matter?